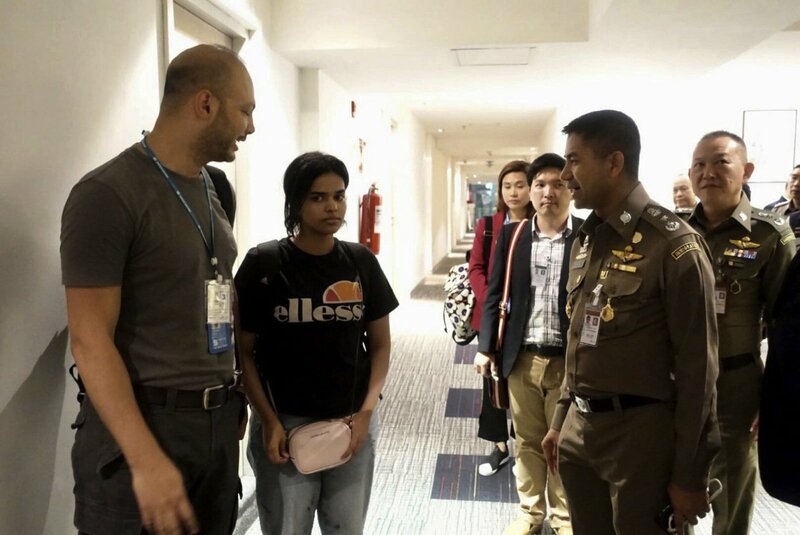 Instead, she was given back her passport and allowed to enter Thailand temporarily under the protection of the U.N. refugee agency, which was expected to take about five to seven days to study her case and her claim for asylum. The office of the U.N. High Commissioner for Refugees said in a Tuesday statement that it would look into Alqunun’s case “to assess her need for international protection.” She has said she wants to go to Australia to seek refuge there. Surachate said Alqunun’s father and brother were due to arrive soon in Bangkok, but that it was her decision whether to meet with them. On Twitter, she has expressed fear of such a meeting. The father had previously been expected Monday night. Meanwhile, Human Rights Watch called on the Australian government to allow Alqunun’s entry into that country. While Surachate claimed Alqunun never had a visa to enter Australia, Human Rights Watch’s Australian director, Elaine Pearson, said she had seen electronic confirmation of the visa, shown by Alqunun to HRW’s Asia deputy director, Phil Robertson. But, Pearson said, Alqunun could no longer access her visa page on Australia’s immigration website on Tuesday, sparking concern that the document had been canceled. An Australian visa is usually processed electronically and not stamped in one’s passport, but confirmed by a document that the visitor can print out. Though refugee status would mean a different form of visa would be needed, Pearson said Australia’s apparent cancellation of Alqunun’s tourist visa was a worrying sign. “It’s extremely concerning if it is the case that the visa has been canceled,” she told The Associated Press, adding that Australia should allow Alqunun entry in any case. Since Australia has expressed concern in the past about women’s rights in Saudi Arabia, it should “come forward and offer protection for this young woman,” Pearson said.